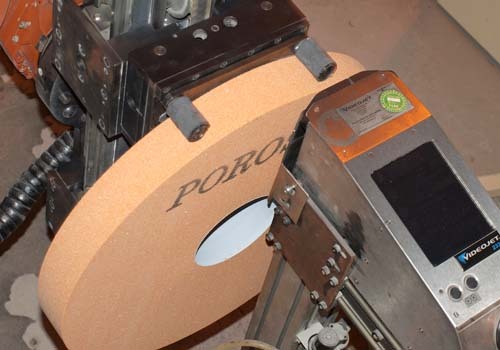 An in-feed conveyor receives grinding wheels that have been machined to size. They are then picked up by the robot and tested for balance, printed with the manufacturers logo and product information, speed tested, and finally put onto pallets. 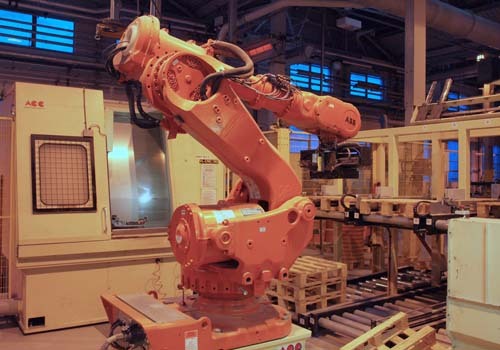 The gripper head has interchangeable grippers and can be used for gripping wheels externally, internally, or can have pallet forks for loading empty pallets onto the out-feed conveyors. The head carries a Laser sensor that is used for measuring wheel thickness, and a camera system that measures wheel and bore diameters. In this way the system verifies that the wheel that has arrived on the in-feed conveyor is correct. The printing system uses an industrial ink-jet printer, capable of printing both text and graphics up to 70mm high in a single pass. 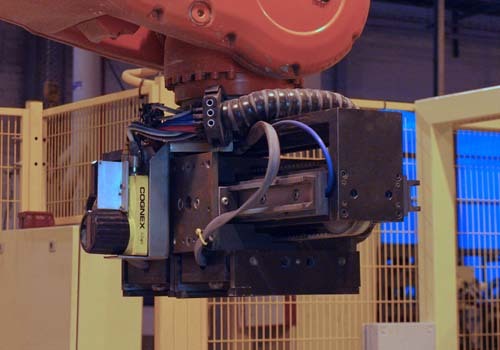 The appropriate text and logo is selected by the cell controller as the robot moves the wheel in front of the print head.